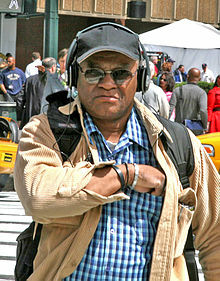 Biff Henderson in New York City. Henderson was born in Durham, North Carolina, in the Hayti District. He acquired the nickname "Biff" from his mother when her friend had a dream involving a boy named "Biff". He graduated from Hillside High School in Durham, and earned a degree in business administration from Hampton Institute. He also served in the United States Army during the Vietnam War. Henderson worked as a stage manager on the 1969 version of To Tell the Truth. He joined NBC in the early 1970s, working first for the NBC Radio sales department and then as stage manager during NBC's coverage of the World Series and coverage of various NASA missions. His association with David Letterman, which spanned 35 years, began in 1980 as a stage manager on The David Letterman Show (NBC). He rejoined Letterman with the launch of Late Night with David Letterman (NBC) in 1982, remaining with it and Late Show with David Letterman (CBS) for their entire runs. Henderson frequently participated in the on-screen antics and sometimes was the star of short segments recounting his humorous adventures in New York. Henderson's "theme" music on the show was "Milestones" by Miles Davis. Henderson took part in a Jimmy Kimmel Live! skit honoring Back to the Future during a Kimmel broadcast from Brooklyn in October 2015. When Michael J. Fox (as Marty McFly) and Christopher Lloyd (as Emmett Brown) ask Kimmel what became of their nemesis Biff, Henderson came onstage, prompting "Marty" to tell Kimmel, "no, not that Biff." ^ Wadler, Joyce (February 13, 2002). "PUBLIC LIVES; A Straight Man Who Won't Dwell on the Bad Stuff". The New York Times. Retrieved October 22, 2015. ^ a b c "Late Show Cast: Biff Henderson". CBS TV. CBS. Retrieved May 19, 2015. ^ Blake, Meredith (October 23, 2015). "Highlights from Jimmy Kimmel's week in Brooklyn". Los Angeles Times. Retrieved November 5, 2015. ^ Ramisetti, Kirthana (October 22, 2015). "Marty McFly, Doc Brown visit Jimmy Kimmel Live for 'Back to the Future Day'". Daily News (New York). Retrieved November 5, 2015. This page was last edited on 19 September 2018, at 04:04 (UTC).